Atlantic Transmission Service is a family-owned & operated full service automtive repair shop that has been serving the greater Baltimore and Glen Burnie communities since 2003. Owner and transmission repair specialist Ed Wright, as well as his team of ASE Certified automotive repair specialists and technicians are dedicated to ensuring their customers get only the best in auto repair services. Atlantic Transmission Service offers a complete range of automotive repair services to the Baltimore area. Our team is expertly trained, qualified, and dedicated to ensuring the quality of our work meets industry standards and exceeds our customers' greatest expectations. From transmissions to brakes, alignments to suspension, our team can get you back on the road quickly and safely. 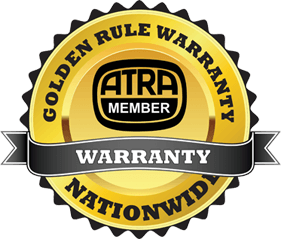 Atlantic Transmission Service is a proud member of ATRA, the Automatic Transmission Rebuilders Association and offers ATRA's Golden Rule Warranty to all of our customers. The Golden Rule Warranty is available in both 12 Year / 12,000 Mile and 3 Year / 100,000 Mile options and protects your rebuilt transmission at ATRA member shops from coast to coast. Atlantic Transmission Service is a full service transmission repair shop offering service to the entire Baltimore ~ Glen Burnie Maryland area. Each transmission specialist at Atlantic Transmission Service is professionally trained and ready to provide their expertise at repairing and servicing transmissions for any and all of your manual and automatic transmission repair needs. The Atlantic Transmission Service shop is member of ATRA, the Automatic Transmission Rebuilder Association. As an ATRA Baltimore MD transmission shop, Atlantic Transmission Service conforms to the service and repair definitions that make up the ATRA code of ethics and bylaws. Atlantic Transmission Service promises to each of our customers that our Baltimore ~ Glen Burnie transmission shop will not remove a transmission from a car or truck to complete a repair unless we are required to do so. Furthermore our transmission shop promises to diagnose problems with transmissions for all of our customers in an honest and professional manner. Our transmission shop makes every attempt to provide prompt and courteous service to everyone visiting auto transmission shop in the hope that they will come back to us for all of their automotive transmission repair needs. Browse our web site and if you have any questions, don't hesitate to come by, e-mail or telephone us at 410-609-1277 as we are always here to assist you. Atlantic Transmission Service is proud to included with the following auto repair companies. Atlantic Transmission Service invites you to take advantage of our easy 24/7 online scheduling! Simply complete and submit the appointment form to schedule your repair. Atlantic Transmission Service offers our customers in the Glen Burnie area nationwide protection. Our warranties are among the best in the automotive repair industry. Atlantic Transmission Service is always interested in hearing from qualified individuals seeking employment at our Glen Burnie automotive repair shop. If you are interested in joining the Atlantic Transmission Service team we want to hear from you. Atlantic Transmission Service is pleased to introduce our valued team of automotive repair & service specialists. Our staff is dedicated to ensuring our customers get only the best auto repair in Glen Burnie, at the right cost, and to their complete satisfaction. The bio for this staff member currently being updated.